Do you have a favorite player from your youth who captured your attention simply because he had that one magical year? The season that corresponds with your developing a passion for the game of baseball? 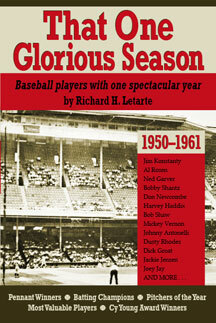 Author Rich Letarte has collected the stories of twenty-one of those types of players from 1950 – 1961 in his book That One Glorious Season: Baseball Players with One Spectactular Year . We are delighted to have Rich appear on the Cover the Bases podcast to share his stories about writing this book. He tells us about getting to know some of the players and even the wives who helped direct his work. First though, we get to hear how Rich became a baseball fan as a youth in the early Fifties. For Rich, there was something special about the 1954 New York Giants, and in particular an attraction to a player by the name of Dusty Rhodes. This was the World Series Championship year for the Giants, immortalized by the Willie Mays catch, but for a young boy truly forming his baseball roots, the four for six pinch hit performance of Rhodes, driving in the go-ahead or tying run in all three games he appeared was a seed that eventually became this book. Dusty Rhodes had an entire 1954 campaign that was marked by crucial clutch hits coming off the bench, combined with Johnny Antonelli’s 21 win season, and Rich had the basis for the types of characters he was going to portray in his book. Many of the players profiled were top of mind for Rich to include, but as he was compiling the book he decided that it would be appropriate to represent every team with at least one player. He dug around the rosters for representatives from the Tigers, Cardinals, Senators, and Yankees to round out his collection. Rich also details for us a personal story of his which is represented by a photograph in the front of the book. As a young boy in 1954 he was fortunate enough to have collected the most money for the Jimmy Fund, and got to present the check to Ted Williams in the Red Sox dugout. Waiting in the dugout to make the presentation, Rich(ie) spoke to many players, but in particular Jackie Jensen. Rich gets to recount the story to Jackie Jensen’s widow many years later as he is putting this book together. Yesterday we reached the conclusion of the fourth Legendary Game we have presented batter by batter in the “hidden” scoreboards on the Baseballisms web site. 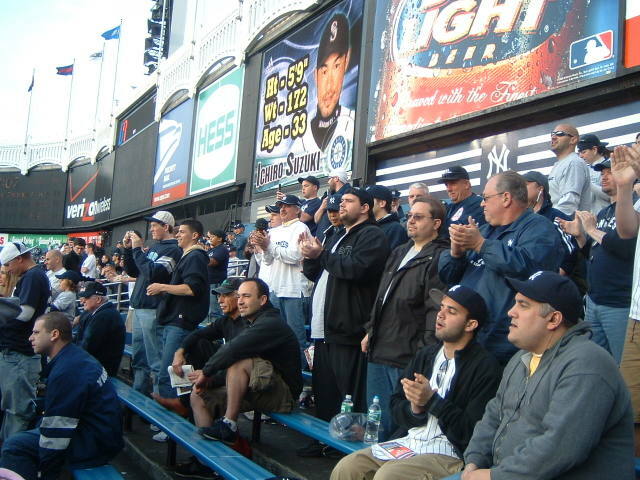 We try to find games that have some emotional meaning either for us as fans (Gibson’s Homer, Leyritz’ Homer, ’86 World Series), or we try to put ourselves in the shoes of other fans who may have had their own indelible response to the events that took place. As our friend Shawn Collins or any other New York Yankee fan could attest, this recent game we highlighted, Don Larsen’s Perfect Game during the 1956 World Series, has to be one of the most remarkable accomplishments in team history. A remarkable accomplishment in baseball history period! It is hard to imagine what the media crush might be if this feat were to be repeated in this day and age. In 1956, the only live coverage would be from the radio & TV stations across the country that happened to pick up this day game broadcast. The analysis and breakdown of the game happened in the daily newspapers .. the following day! Today it would be a night game so it would go late into the evening, and it would begin to gather some trending topic mentions on Twitter while it was happening. This would really build up momentum as the unmentionable perfect game was in progress! Then, I believe that you might begin to see some live cut-ins from ESPN and other sports networks, although they would be restricted from showing actual footage due to the exclusivity of the broadcasting network .. you might still have some anchors beginning to do some spots. The pressure of the situation would almost be unbearable for fans and players alike (I know I had a hard time watching Randy Johnson’s perfect game against the Braves in ’04). On the field each player would be starting to realize that they better make all the plays otherwise they might be a victim of seeing themselves in a “Buckner moment” over and over again in the media. Finally upon successfully completing the perfect game, footage would be transmitted across the globe instantaneously, social networks would be buzzing with posts and comments, the sports networks would be thrashing to get good insights into the player and the moment by interviewing every player, coach, even locker room attendants …. and of course the pitcher would be instantly receiving invitations to appear everywhere from Disney World to a request to post his own Baseballism on this site! We applaud the amazing accomplishment of Don Larsen and would love to see it happen again. May it happen to the right guy! We hope you enjoy these little games that we produce every single day .. check out Our Fifth Legendary Game beginning tomorrow and let us know in the comments if you have any guesses as to which one we are presenting. And if you have your own personal Baseball story that you would like to share, please visit our Upload page. We look forward to receiving it!